These folks encourage us to pray for 20 minutes a week. These tips help you stay focused on the issue. One of the Most Beautiful Pictures of a Baby in the Womb That I’ve ever seen. Late this afternoon, I felt compelled to go for a walk in the snow. I had been inside working pretty hard all day, and I thought my body was simply saying, “get some fresh air.” But was that all it was? I walked up to the church near my house, and noticed a woman standing near the building. I was curious as to why someone would be at the church on a Saturday night, so I walked over towards her. As we drew closer, we recognized each other. In order to keep the situation confidential, I will call her Sue. Sue and I had a number of brief conversations because she worked at a place that I frequented pretty often. We always enjoyed our little chats, and actually encouraged each other. We both were followers of Jesus, and we seemed to have a lot in common. “Oh, what is that,” she asked with interest. I detected a bit of discomfort on Sue’s part and we talked a bit more about how so many churches are not taking a stand on this issue. “Where are you at with the topic,” I gently asked her. She told me a few more details about her grieving. I told her I would love to talk to her more, and she eagerly gave me her number. I am now doing more research about how to help post abortive women. I know that Loving Choices has some counseling available, and that groups like Project Rachel are available. This article about how to talk to a friend who has had an abortion was very helpful. You know, if I hadn’t been willing to share about my passion for stopping abortion, the topic would not have come up. My intention is to find winsome ways of bringing up abortion so that more conversations like this can be had. Even if someone is pro-choice, there can be a good conversation if I am willing to listen, as well as be well-informed about why abortion is so destructive to women, men, and babies. I feel grateful for this encounter with a beautiful woman with whom I really look forward to talking to. I think we are going to be friends. This article offers very detailed information on how to heal after an abortion. Just reading this inspires me to work even harder to help women change their decision to abort their baby. I didn’t realize how complicated and difficult it is for a woman who has had an abortion to heal. But I think the conclusion is that many times women do suffer symptoms of post traumatic distress disorder after abortion. Even though the writer tries to console the post-abortive woman by telling her she has done nothing wrong, she seems to think the problem is serious enough to write about it. I think that reading about the issue from a person who appears to have a pro-choice attitude can increase our understanding and help us to dialogue with those with differing opinions. Here is the article. When I think about how the prayerful, peaceful, pro-life group, I volunteer through, 40 Days for Life, is being prohibited from displaying signs in any way, it saddens my heart. Why does this affect me so deeply? Well, because, whenever I stand vigil in front of Planned Parenthood, one of the major pulls on my heart is to offer women and their unborn babies care and support. However my ability to do this has been greatly inhibited. You see, now, I can no longer easily offer women—women who may be considering abortion—other options, because I am prohibited from displaying one of my group’s signs, part of which reads, “Pregnant? Need Help? 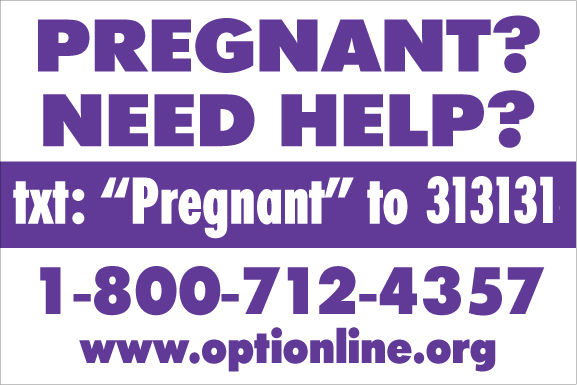 Txt: ‘Pregnant’ to 313131,” whose contact information leads to free alternatives to abortion such as the support for adoption and parenting that Loving Choices Pregnancy Center offers. I feel that the removal of my right to hold our group’s sign offering this form of support also means the removal of a woman’s opportunity to be thoroughly and objectively presented with options other then abortion, especially considering the fact that Planned Parenthood benefits financially ($660) every time a woman chooses abortion there. You see, my heart is saddened because, the consequences of my fellow volunteers and I no longer being able to hold signs reach beyond ourselves or our group. I learned with dismay that the group that I have been part of for the past 4 1/2 years, 40 Days for Life, has been told by the Arkansas Highway Department that they can no longer hold their signs near Joyce and Crossover. Even though they have received permission from the Fayetteville Police that they can stand and hold signs on a specific location in front of the Planned Parenthood Health Clinic and abortion facility, the state has basically censored us. I read in a second article that the Highway State Department is not responding with any good answers to the press. I sincerely hope they do have a good justification for their actions, which are very confusing since we have been holding peaceful vigil there with volunteers braving the cold, rain, heat and all kinds of discomfort for 8 40 Day vigils. I know that abortion is a very controversial issue, one that is not talked about enough. I hope that everyone will agree that even though we may not agree on a topic, we all have the right to express our opinions, including using signs to express our views on the public right of way. I am so proud to be part of a peaceful pro-life group that unites Catholics and Protestants, and people of all denominations who know that abortion is killing an innocent baby and who are willing to sacrifice comfort and time to stand in front of our local abortion facility, Planned Parenthood, to pray and hold signs with the goal to end abortion.